Developing a Comprehensive Security Program answers the question common among security managers, "What is a model security program, and how does our program compare to it?" In this seven-minute Proven Practices presentation, narrator Elizabeth Lancaster outlines the baseline elements of a security program, which have been defined by experienced Security Executive Council members and research. This presentation is not sector-specific--meaning it's applicable for all organizations and industries. In addition to the baseline security program elements, Lancaster also discusses business-aligned program elements, program characteristics, a program maturity model, and the skills and knowledge the security department needs to possess. Developing a Comprehensive Security Program may be used as a benchmark for existing programs and to educate senior management. It also provides a general understanding of the security function as it currently exists. 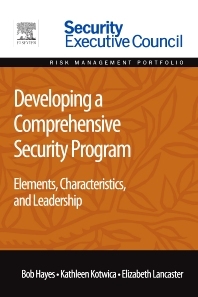 Developing a Comprehensive Security Program is a part of Elsevier's Security Executive Council Risk Management Portfolio, a collection of real world solutions and "how-to" guidelines that equip executives, practitioners, and educators with proven information for successful security and risk management programs. Liz Lancaster is the director of member services and projects for the Security Executive Council, an innovative problem-solving research and services organization. She is responsible for planning, processes and project management around the member services program. As members' direct communication link to development of Council strategic initiatives, member services is key to the process of helping members and their staffs make an impact in the areas of security that are important to them, their business and industry. Liz brings 25 years of combined risk management, business and consulting experience in investigations, access control systems, design and project management, security server finance, sales and administration, commonwealth and public/private corporation emergency response planning, uniform guard services and corporate security staff training and development, executive travel safety and risk assessments. She has held positions with the Massachusetts Department of Correction; assigned to the Office of Investigations institutional internal affairs division; Applied Risk Management LLP as a Sr. Technical Consultant; Boston Scientific Corporation as Manager of Security Integration and Investigations; Astra Pharmaceuticals LP as Security Project Leader; and Stratus Computer, Inc. in continuous availability server sales and finance. Liz holds a master of arts (1995) and a bachelor of science (1992) in Criminal Justice Administration from the University of Massachusetts. She is a member of the Women in Criminal Justice Organization, Risk Analysis Group Integrated Risk Solutions, Balanced Scorecard Collaborative, and ASIS International. Liz is Council Staff Editorial Advisor for Security Technology Executive magazine and has authored several articles in industry trade magazines.